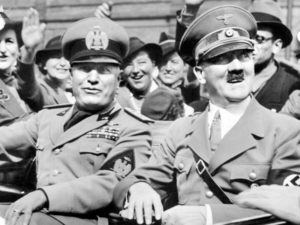 Hitler and Mussolini never had a great relationship. The German dictator modeled his career on the Italian fascist, imitating Mussolini’s speech and mannerisms, and unsuccessfully tried to replicate the March on Rome with the Beerhall Putsch. Mussolini, for his part, didn’t pay Hitler much mind until 1930, much to the Furher’s chagrin. When the men first met in 1934 they got into a horrible argument about the fate of Austria, and Hitler later sent some material aide to Ethiopia during Italy’s conquest. However, the to fascists would eventually find themselves isolated from Europe’s liberal democracies, and by 1938 it was almost as if they were natural allies.